View any file online directly in your browser. When you’re browsing for files online, it’s always a bit annoying to have to download something, then open it up in a third-party application just to view it. Docs Online Viewer lets you open up most major file formats you come across right in Chrome. Not only does the extension save me time but it also helps keep my laptop's hard drive free of clutter because I am downloading fewer files. This beauty allows you to view just about every document file type imaginable, directly in your Web browser, without the need to download the document. This extension inserts a small clickable icon (like this ) beside each supported file link in all the web pages. Clicking on the icon opens the corresponding file directly in your browser as if it is just another web page. Install Docs Online Viewer before testing. If you already have it installed and enabled in your browser, you should be able to see an icon beside this sample docx file link. Clicking on the icon should open a sample document using Docs Online Viewer's supported services. It works with any publicly accessible file. You can also try Google Search for sample documents to test it. Go to Docs Online Viewer options page to configure it as you like. To open the Options page, click on the "Options" button in the popup as shown in the image. You can also access the options page by going to your browser's extensions page. 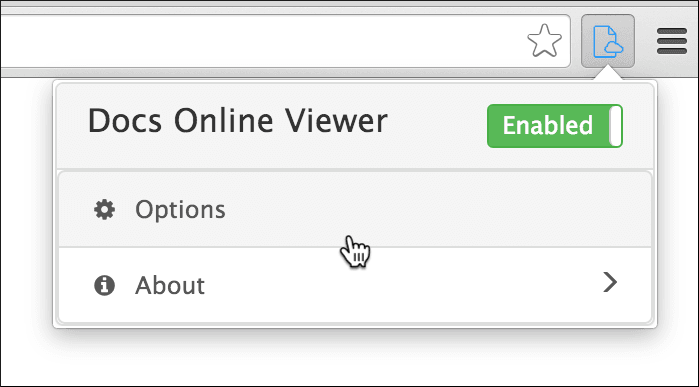 For example if you are using Google Chrome, go to Settings → Extensions → "Docs Online Viewer" Options. You can configure the icon click behavior, supported file types and other settings using the options provided.